A Vacation Rental Agreement is used when a homeowner rents his vacation home to a lessee fora fixed period of time. Sample Vacation Rental Agreements Terms and conditions are stated about the condition and maintenance of the home. Date of signing the agreement should be stated clearly along with the names and designations of both the involved parties. The amount of payment should be stated clearly with the required security deposit with the steps to be followed for default payments. You can now download our well designed templates for vacation rental agreement right here in word and pdf format as per your requirements. Leasing is a legal procedure which means that if you want to get proper results and satisfaction of leasing then you should necessarily download vacation rental agreement templates. Agreement is necessary and vacation rental agreement template will allow you to get trustworthy agreements for your requirement. 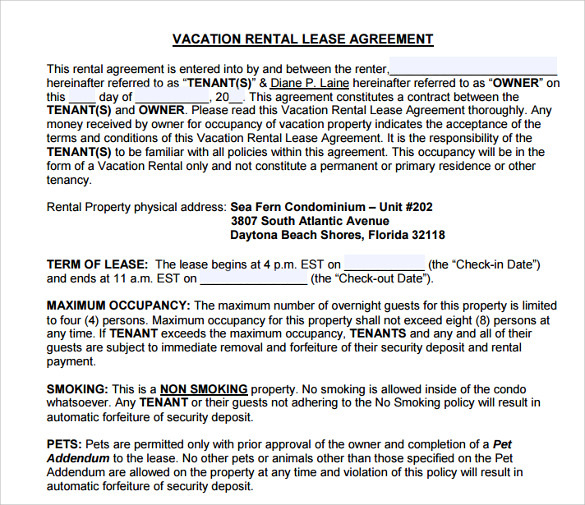 Searching for terms and conditions of vacation lease is a confusing task. There is a lot of different information available on this matter. 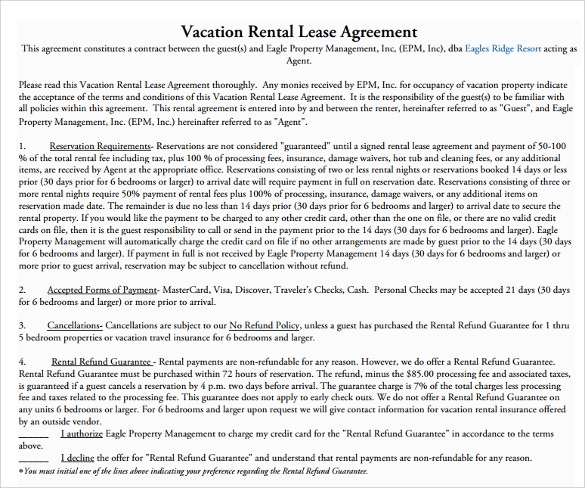 If you want necessary information then you should download vacation rental agreement templates. Template will assist you and give you standard information about vacation leasing. When there is a requirement of vacation rental of any property for short period of time, you would need to make sure that you find appropriate agreement for that. There are different vacation rental agreement templates available for different purposes and you can use them for all your needs. Vacation rental is quite popular these days. If you want to rent your vacation property then you would need to find appropriate vacation rental agreement templates for this purpose. This will allow you to get advantage of all features in your agreement. 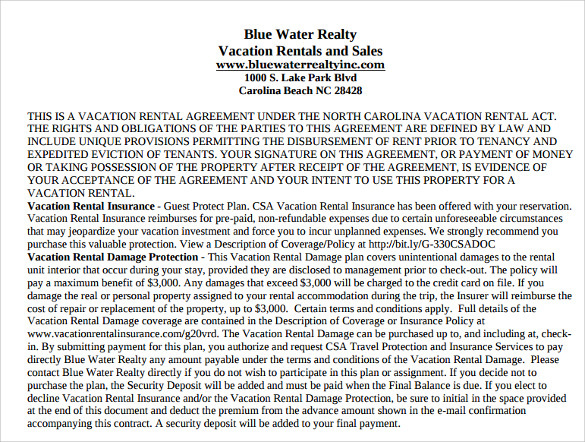 Why do You Need Vacation Rental Agreement Templates? Templates are the best way to minimize your effort requirement for this task and you would be able to do all the preparation and creation procedure in shortest period of time. You don’t need to invest more time in it because you just have to fill your information in the agreement and that is all you need to do. 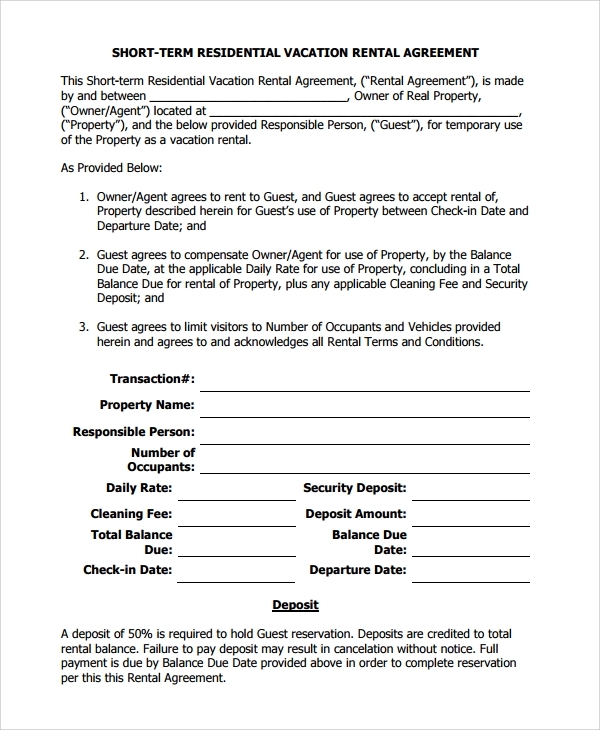 When do You Need Vacation Rental Agreement Templates? You can find variety of range of vacation rental agreement templates on the internet to download for free. You can download the template that seems to be the perfect choice for your requirement and then you can fill the required details in it. Your agreement would be ready for further process at the time when you download it. It is clearly impossible for anyone to remember the terms and conditions of rental agreement even if you are expert in it. When you are going through the process of vacation rental agreement selection for the first time then this will be really hard for you. 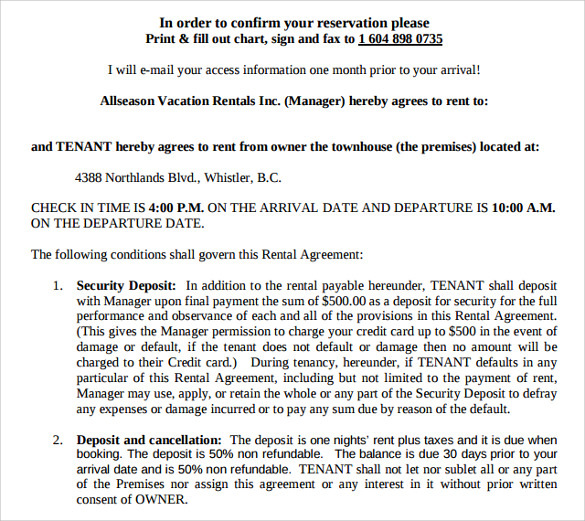 You can easily make this process simpler and quicker for you with the help of vacation rental agreement templates. Templates are limitless which means that you have limitless options to choose from. Simple search would be enough for you to make the selection of perfect template and then you can get all the necessary information about leasing without even researching about it. Leasing is a matter of responsibility and it is necessary for both parties of leasing to understand their liabilities and privileges. 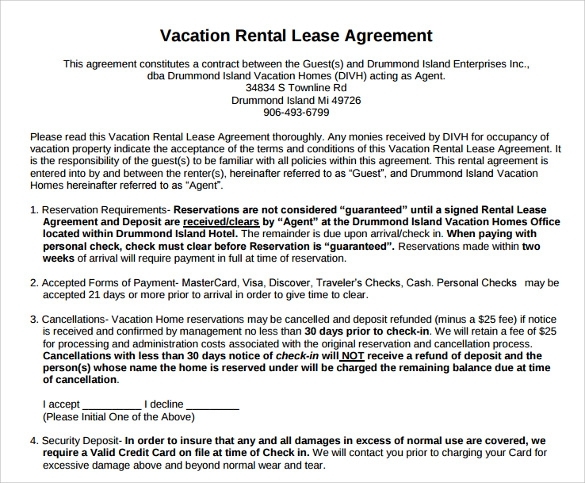 Choosing vacation rental agreement templates will allow them to get proper awareness of these features of agreement. There is no editing or formatting necessary for these readymade templates.